My next hardcover for Black Horse will be published May 29th and the cover image is shown here. I'm not sure what that hand gesture from the cowboy in the background means, but it looks rather odd, not to mention obscene. Of course there is always that possibility that he's a literary critic sending me some sort of message. There are times when it seems that even the Good Lord above might have something personal against the town of Jerusalem - day after day the sun does its utmost to roast the very land upon which the dilapidated town sits. Johnny Jerusalem is returning home to the town that gave him his name. He'd left many years previously in search of a fortune he didn't find, but no sooner is he home than the little money he has is stolen from him during a bank robbery. 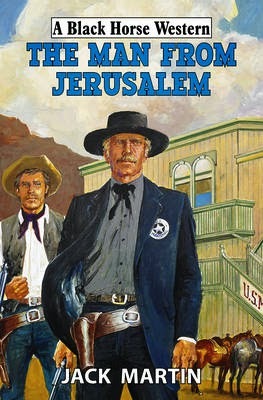 Johnny sets out with a young gunslinger to find the culprits who have wronged him. There's a posse behind them, bandits ahead of them and soon bullets fly as Johnny and his young companion realize that death comes from all directions. Agatha Raisin The Quiche of Death TV Movie Review. I've just caught up with the TV movie of the first Agatha Raisin novel,. The Quiche of Death which was shown on Sky over the Christmas period, and to be honest I think Sky made a botch job of the movie. As a fan of the books the biggest problem with the TV movie was the casting - I just can't get over the casting of Agatha Raisin herself, actress Ashley Jensen is far too young and glamorous for the role of the nosey old battleaxe that is Agatha Raisin. And the neighbour, love interest, described in the book as being a distinguished looking man in his mid fifties is also far wide of the mark - Sky have cast Jamie Glover, a man more James Bond than James Lacey. I'd been looking forward to this TV movie and I did give it a chance but it just didn't seem right to me. There was nothing wrong with Ashley Jensen's performance but she seemed ridiculously young - we are supposed to believe that she is a successful businesswomen who decides to retire and move to the Cotswold for a life of peace and quiet. but this just doesn't ring true. And no sooner did I settle into the show than they introduced James Lacey and I realized that Sky's production was Agatha Raisin in name only. The BBC adapted the novels into radio dramas several years ago with Penelope Keith in the role of Agatha Raisin and these were uniformly excellent, and remained faithful to the original novels It's a pity that Sky took a different route with their version of Agatha Raisin. 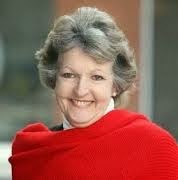 I think I'll stick with the original novels and the BBC Radio series - that's where you'll find the real Agatha Raisin. Libraries should be more like coffee shops, claims a new report commissioned by the Department for Culture, Media and Sport - the report which likely cost a fortune to carry out, came up with findings that are as expected pure tripe. Libraries should, the report claims, deliver Wi-Fi in a comfortable setting when in reality many libraries do this already. It was also claimed that libraries should be more like retail outlets with the usual amenities of toilets, sofa and special offers. Though I can't help feeling that making libraries more like retail outlets goes against the entire philosophy of what a public library should be. 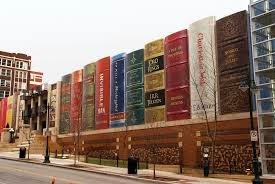 Libraries across the country have been closed down over recent years by local authorities in a brutal program of cost cutting exercises and once these libraries have gone it is unlikely that we will ever see them again. William Sieghart, author of the report told the Independent newspaper that he found it astonishing that one third of England's libraries don't yet offer Wi-Fi. He said that while libraries remained a vital part of the community there need to be a reinvigoration of the library system in this country. A task force will be created designed to work with local authorities to improve and revitalise libraries. The first meeting of the task force will take place in February 2015. That's all very well but local authorities should cease closing public libraries at once - it is shameful the way councils up and down the country continue to waste money and yet make severe cuts to vital public services. I like to think that this task force will do some good, but the realist tells me that it is all a smoke screen to close yet more libraries. This month writers across the country will feel one of the very real effects of library closures when their annual statement for PLR payment (Public Lending Rights) arrive in inboxes. I took a drop in my own PLR payments this year, despite having more titles available than the previous year. I may have more books out but there are less libraries supplying my books. For most professional writers PLR payments are essential, after all most of us don't earn big money from our work, and we are acutely feeling the effects of the brutal program of library closures across the country. Sherlock Holmes and the Queen of Diamonds, a pastiche by David Whitehead and Steve Hayes, two writers well known to the Archive, is now available as a low price Kindle eBook and it's well worth reading and will appeal to not only fans of Sherlock Holmes but anyone who likes a well written, no nonsense action adventure with a cerebral leaning. I found it interesting that the authors chose to write this Holmes book in third person, rather than the more usual first person from Watson's POV - After all Conan Doyle used the first person with Watson narrating the story for most of his Holmes adventures. True he did use the third person a couple of times, as well as having Holmes narrating a couple himself but these are oddities and don't stand up there with the best of Conan Doyle's Sherlock Holmes adventures. I asked author David Whitehead why he opted for the third person and he told me that he wrote the novel from an un-produced movie script written by Steve Hayes and that the third person narrative style was the only way to tell the story. 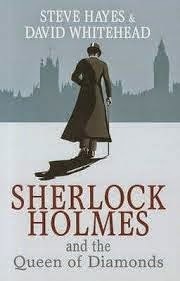 After all there are sections of the story that neither Holmes, nor Watson witness. And of course using the third person means that the author(s) don't have to slavishly try to recreate Conan Doyle's own style, which is often a failing with Sherlock Holmes stories by other hands. The story starts off feeling very much like a traditional Conan Doyle Holmes adventure but there is a major twist around the half way point that I just didn't see coming, and from that point onwards the feel of the book changes and it becomes a roller-coaster action adventure - think Guy Ritchie's Sherlock Holmes but with more substance. The Holmes of this book is very much the deductive genius we know and love but Watson seems often to be a rather useless appendage, likely due to the third person narrative and of course that the main thrust of the story is not the relationship between Holmes and Watson, something intrinsic to the Conan Doyle stories, but rather the relationship between Holmes and a brash American, whose identity I'll leave the reader to discover for themselves. That said this does indeed feel like a Sherlock Holmes adventure and I was hooked after the first few pages. If you like Sherlock Holmes then you'll enjoy this, but the book will also appeal to those who enjoy a damn good adventure - the kind of book that used to fill the paperback rack in years gone by. Quite excellent...a story that can quite cleverly fit into the canon without causing any major ripples. 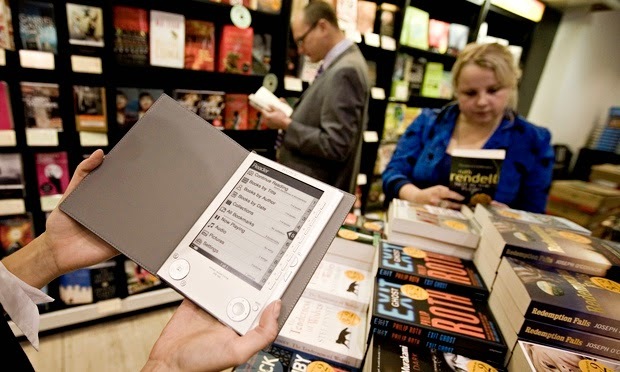 Sales of adult print fiction declined in 2014 but digital fiction prospers. The latest Neilsen Bookscan review which looked at the book market during 2014 shows a decline in sales for adult print books, whilst the market for adult digital fiction has taken another jump with predictions that the consumer eBook market will be worth £350m this year. Out of all the adult print books published during 2014 only three titles sold more than 100,000 copies. These big sellers were from Lee Child, Martina Cole and CJ Sansom. 'Any drop in sales of adult fiction can mainly be put down to the migration to eBooks,' Said The Booksellers, Phillip Jones in reponse to the Neilsen report. 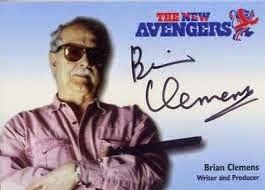 Sad to hear the screenwriter, Brian Clemens has passed away at the age of 83 - my generation grew up with his writing. He penned scripts for shows such as The New Avengers, The Persuaders, The Champions, Danger Man and many others. In fact the list of 1960's/70's adventure television he wrote is endless. Later he went onto create The Professionals which starred Lewis Colins and Martin Sheen but he was also responsible for movie scripts such as The Golden Voyage of Sinbad and Highlander: The Quickening. He left behind him a legacy of cult television that will be enjoyed and admired for many years to come.